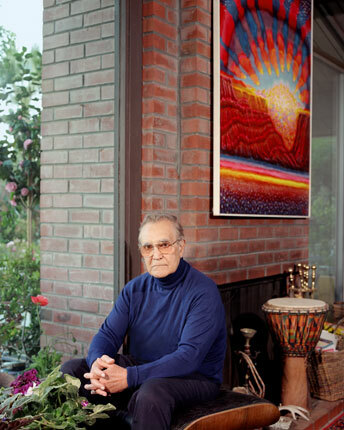 Frank Sardisco was an artist first and a teacher second. Vying for a close third are world traveler, master gardener, and philosopher. His work has been described as abstract classicism and is notable for its passionate use of color and subtle texture. His aim is to take realism and abstract away from it, emphasizing lines and shapes and creating not a photograph, but his own emotional response to it. Nowhere is this more evident than in his Grand Canyon series. Just as nature has chiseled away at the land, so has Sardisco redefined elements of rock, water and sunlight to paint the essential Grand Canyon. His teaching career began at Woodbury University, continued at Ventura College and concluded with his years at Moorpark College, where he developed and was head of the art department. Frank Sardisco’s documentation took place in 2004 and was sponsored by Dr. Richard Gould. The FOTM Archive contains extensive information about this artist.